Why she does what she does…. Dogs… Puppy breath; Teacup to giant; Training class honour student or drop-out brat; Einstein or Goofy; Slurpy kisses, snugglilicious! 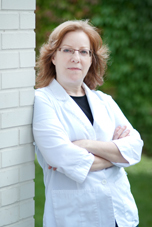 Dr. Slodovnick is a graduate of the Faculty de medecine veterinaire of the University de Montreal, class of 1983. She also obtained her MBA from the University of Concordia in 1997.